When the Second City comes to Woolly Mammoth Theatre, it is a reminder that nothing is sacred and that for more than 50 years, the Chicago troupe has been humorously incorrect long before it was incorrect to be incorrect. Founded in Chicago in 1959, and naming itself for Chicago’s annoyance at being referred to as America’s second city, the improvisation company has had a long run as a tough proving ground for young comedians who go on to great success. It was there before Saturday Night Live and showcased such future stars as Bill Murray, Stephen Colbert, Dan Aykroyd, brothers John and Jim Belushi, Alan Alda and John Candy. Laurent opened the evening by selecting a couple from the front row and playing on the couple’s boasting of 28 years together. It was a few minutes of fun that emphasized the agility and creativity of the five-person cast, who made references to the couple’s span of contentment throughout the rest of the show. Woolly has booked Second City several times and it helps bring in younger theater-goers who easily connect with the incorrect, often outrageous, but funny lines and skits. 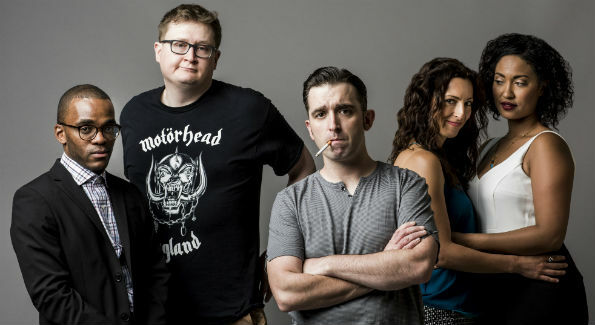 Along with Laurent and Turner, the other cast members, Adam Peacock, Kevin Sciretta, and Nicole Thurman, display the masterful comedic timing learned on the tough Second City stage. It won’t surprise anyone who has attended a Second City performance here, in Toronto, or elsewhere that the company has transformed Chicago’s annoyance of being dismissed as a second city, into being the first city for improvisation and comedy. The Second City’s “Let Them Eat Chaos” continues through August 2 at Woolly Mammoth Theatre, 641 D St., NW. Tickets are $35-$100 and can be purchased at 202-393-3939 or online here.